The classic Firefox desktop browser had by default a separate address bar for navigation and a search bar for search. This however changed with Firefox 57 (Quantum) which introduced the option for a unified bar that combines the address and search bar into one. Mozilla calls it the Awesome Bar. Nevertheless, in the Search Settings one has the option to use the separate bars. While these suggestions are useful, you may want to disable them for various reasons e.g. privacy. Here's how to do it. 1. Go to the address bar, and with nothing typed in it, click the down facing arrow on the far right. 2. At the far right bottom of the drop down window, click the Change search settings gear icon. 3. That will open Firefox Search Settings. Now just below the Default Search Engine disable remove the checkmark from the Provide search suggestions option. 1. In the address bar type about:config then press Enter key. Agree to the prompt. 2. Next, search for browser.urlbar.suggest in the search bar. Firefox will also suggest opened tabs in the address bar. You can identify these suggestions by the tab icon on their side and the Switch to tab label. 1. Repeat the first two steps in the previous section. You'll now not see suggestions from your default search engine, history, bookmarks and opened tabs when you type anything in the address bar. To restore the suggestions, restore the checkmark for the search suggestions and toggle the changed boolean values back to true. If you have a Firefox account and have enabled the option to sync settings across devices signed in with the account, suggestions from these other devices will appear based on what you've opted to synchronise e.g. history, bookmarks and opened tabs. 1. In the address bar type about:config then press Enter key. 2. Next, search for services.sync.prefs.sync.browser.urlbar.suggest in the search bar. 2. 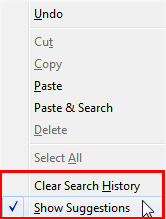 To clear the existing search suggestions click the Clear Search History option. The Show Suggestions option is linked to the Provide search suggestions option in the settings. Thus, disabling either will turn off the search engine suggestions for both the address and search bar. You therefore cannot retain suggestions in the search bar whilst it's disabled in the address bar and vice versa.